New York City has agreed to pay nearly $1 million to dozens of bicyclists arrested over the years during monthly group rides that began as a challenge to the automobile's supremacy but degenerated into an unending showdown with the NYPD. The 83 cyclists were among dozens arrested for mostly minor infractions during the "Critical Mass" rides between 2004 and 2006. The arrests largely stopped in 2007, the year a group of riders filed a civil rights lawsuit, although police continue to monitor cyclists and write tickets for traffic infractions. The caravans on the final Friday of every month routinely drew hundreds of bike enthusiasts who pedaled the unfriendly streets of Manhattan in a pack — and were then systematically pursued by police who said the processions were illegal and unsafe. The settlement, signed Oct. 14 but announced Tuesday, calls for $965,000 in payments ranging from $500 to $35,000 per rider. Much of that money will cover legal fees. New York cyclists said they could claim only a partial victory. Barbara Ross, one of the core participants in the rides, said that even though the arrests have stopped, the police crackdown drove participation down from as many as 1,000 to an average of 30. "The strategy is the same," she said. "They have just as many scooters and police cars following us as they ever did. They are still using intimidation, which is working, because the riders who try us out don't come back the next time." The NYPD has denied engaging in harassment, but city lawyer Mark Zuckerman said in a written statement that settling was "in the best interest" of everyone associated with the case. 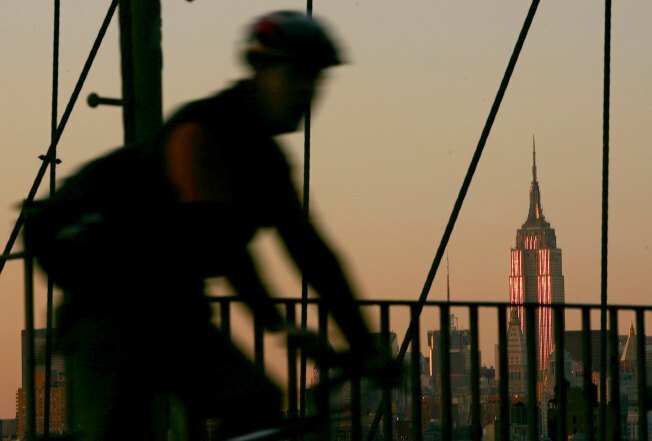 For years, the cyclists said the main purpose of the rides was to call attention to the need to make New York City more bike-friendly, and on that front they can claim some extraordinary advances. Under Mayor Michael Bloomberg, New York City has added hundreds of miles of bike lanes, invested millions of dollars in "greenways" and abolished lanes of vehicle traffic on some thoroughfares to make way for dedicated cycling paths. "The Department of Transportation has been fantastic," Ross said. "We definitely feel safer. ... That's what we feel most victorious about." The situation isn't unique to New York. Cyclists in the Los Angeles version of Critical Mass have had similar bad relations with their police department. The force has complained about the rides, which still draw hundreds, being used as an excuse for mischief. This spring a participant in one ride posted video online of an officer kicking a passing bike. New York police say their strategy of monitoring the rides is appropriately aimed at protecting public safety, and that only cyclists who commit violations are issued citations. Arrests at the events have indeed petered out, but that's due more to better behavior by the riders than a change in policing strategy, department spokesman Paul Browne said. For a number of years, he said, "anarchists" attracted to the ride routinely went out of their way to disrupt traffic. He credited the strong police response with ending that activity and said the rides are now largely trouble-free. "We are just making sure it doesn't deteriorate into the situations we had in the past," he said. New York City also rewrote its regulations regarding parades and street processions after the litigation began, requiring any group of 50 or more people on bicycles to get a parade permit. A federal judge upheld a challenge to those rules last winter. The poor relations between the riders and the Police Department dates to the summer of the 2004 Republican National Convention, when the jaunts began attracting far larger numbers of riders, including some with an anti-authority bent. Like in Los Angeles, people on both sides have been accused of going out of their way to provoke confrontations. The most famous clash came in 2008, when a rookie police officer, Patrick Pogan, was caught on video shoving a cyclist off his bike in Times Square. Pogan was ultimately convicted of lying about the confrontation on an official report and resigned from the force. The cyclist didn't strike a sympathetic figure at the trial, though. Christopher Long described himself to the jury as an anti-government "couch surfer" who got stoned most mornings and was attracted to the rides because he enjoyed the confrontations with police. Ross denied that any of the ride regulars in New York were out to make trouble, and said that if there was any change in the makeup of participants, it was due to police harassment. "The riders changed because they started arresting people," she said. "That stopped the families from coming out."